Shelly was a doll gifted with life by a small group of deities from two opposing groups Devas and Asuras. The group, also known as the Saints in the mortal society, rebelled against their tyrannical masters in order to end a destructive conflict hundreds of years ago, a result which cost them their entire race from the world. However, the tyrants were able to ensure their revival in the future before the rebels could stop them, despite knowing full well that the revival method will corrupt their forms beyond recognition. Realizing that the rebels would not be able to survive long enough halt the revival process, the Saints constructed a doll that could harness and control their powers and placed it in a stasis designed to be broken in the eventual resurrection of the tyrants centuries later. However, the doll could not effectively control all of their powers at once, therefore the Saints sealed their powers in numerous artifacts called the Vedic Runes and scattered them across the world. Unfortunately, the resurrection event started to take place earlier than the Saints had predicted, forcing a premature birth of the doll in form of a child who was unaware of his identity as a Deva. The child was taken in by a local temple in a remote island village of South Horn, who assumed him to be a survivor of a recent shipwreck. He found home among the island residents, earning his nickname Shelly when his friends teased him for constantly mispronouncing Shirley, a title which he initially greeted with discontent, but eventually grew comfortable of. The solace would soon come to an end with the revival of Isadiel the Great Tyrant, a resurrected tyrant in form of a flying leviathan who recognized Shelly's true form and attacked the village once it gained its form five years later. The village was immediately encased in an ice age, and Isadiel slaughtered the inhabitants with its ruthless powers. 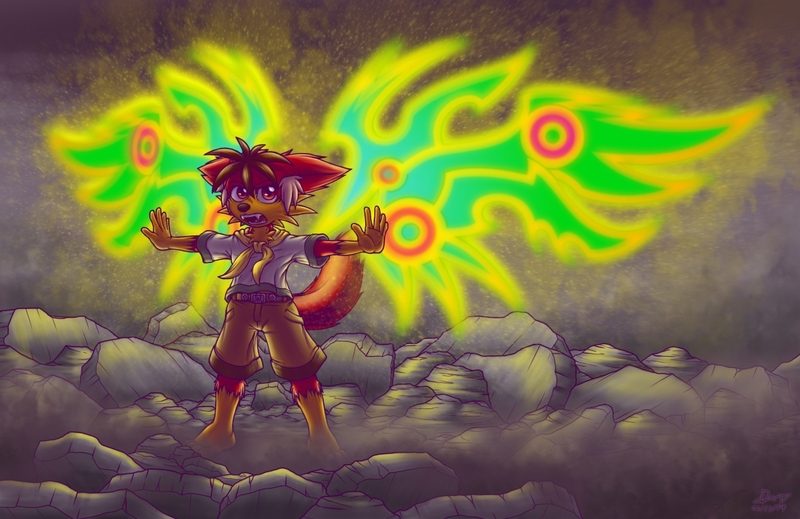 In the ensuing chaos, Isadiel's presence allowed Shelly to unwillingly activate what powers he had and engage the tyrant in the skies, although Shelly was quickly defeated after a brief fight over the seas. Shelly found himself ashore on a foreign land, dazed and having no clear recollection of the events that had transpired with his powers or Isadiel, believing it all to be a nightmare. He chanced upon a local convoy, seeking help and directions back to his home, not knowing that the convoy was a group of slavers who took advantage of the confusion and capture Shelly for enslavement. The slavers forced Shelly further inland, spending several days in captivity until Shelly was able to find a fault in their security and escape. From then Shelly spent two more days wandering the lands before succumbing to exhaustion at the nearby ruins. However, Saber Dust Delivery Service was also operating in the same ruins and Mahin discovered Shelly's near-lifeless body by chance while searching for artifacts. As a spiritual resurrection of the collective will of the Saints, Shelly is pretty much considered the do-gooder hero born in the wrong century of Saber Dust setting, in contrast to Mahin and Lazra's anti-hero characteristics (There are plenty of positively eccentric cast out in the world, but that's for later). He is also one of the most effective counters of the emerging threat of tyrants, being able to single-handedly combat mature tyrants, creatures that in turn can single-handedly decimate an entire city. However, Shelly has trouble mastering the powers granted to him by the Saints due to incomplete revival, a problem further compounded by his internal turmoils. Shelly likes drawing, vanilla ice cream, and travel documentaries, but dislikes mathematics, cucumbers, and Mahin's cooking. He suffers from a moderate case of aquaphobia as a result of his near-drowning experience after losing to Isadiel. Thanks! Took me all day rewriting the story couple of times to make it all fit together. Oh yes, I guess I should mention that there will be select others who want to use him for more sinister purposes. I am having a field day with the script so far. This is excellent! Very creative and absorbing. Can't wait to see more of Shelly. Thanks! It was going to be a snippet, but then I kept expanding it to explain what I was talking about. I'll probably have to do the same thing for my other characters.